Injury Reserve (US) announces debut AUS & NZ Tour! 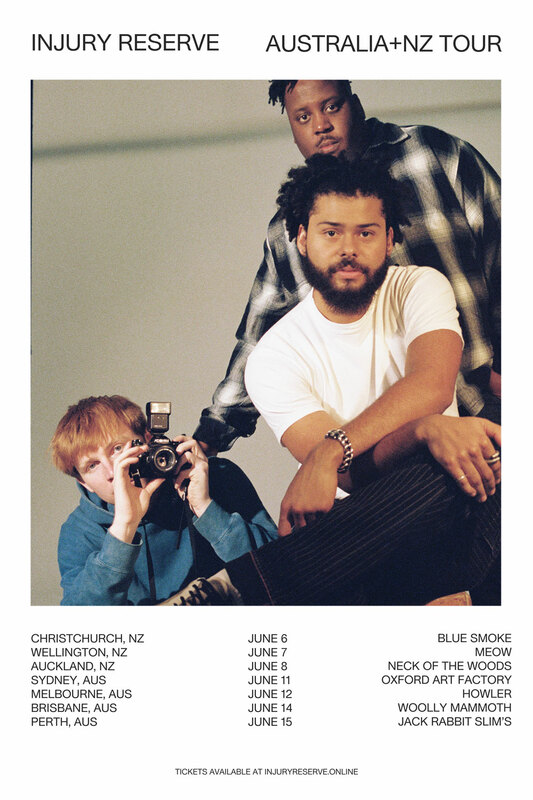 Astral People and Handsome Tours are excited to announce Injury Reserve for their first ever Australia and New Zealand Tour this June, 2019. The rap trio from Phoenix, Arizona are fresh off the back of a huge SXSW show & their new single 'Jailbreak the Tesla', featuring Aminé. Injury Reserve, who recorded their debut mixtape in a dentist's office (and titled it 'Live from the Dentist Office'), have had an interesting journey from the USA suburbs to a coveted "A MINUS" from Robert Christgau, the "Dean of American rock critics," in his column for Noisey. From playing house shows to being played on Beats 1 Radio by Ebro. Injury Reserve will be bringing their unique sound with their trademark energy to a city near you - Make sure you don't miss out!